We learned several games and I had the chance to teach a few favorites to others. We were able to pick up a few more and began playing them immediately after we got home. Best of all we spent great time with family, old friends, and new friends. Klondike Rush: We started with Red Raven’s latest. Klondike Rush went straight to retail, which is refreshing in today’s world of perpetual Kickstarters. 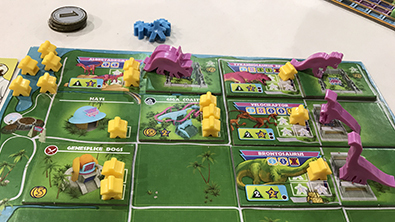 That said, the game felt quite different from the other Ryan Laukat games I’ve played, which may have explained the decision to skip the Kickstarter. We enjoyed the bidding and mine building, it was a nice warm up for what was to come. Quests of Valeria: I had never heard of this tableau builder. One of our friends purchased this in the game swap (and then won “Villages of Valeria” moments later in a giveaway). We enjoyed this quick game of collecting citizens and completing quests that felt a lot like “Lords of Waterdeep the card game” likely would, if they made such a thing. Magic Maze: My wife and I had played this once prior and we were able to show it to the rest of our game group. This simple game becomes amazing when you implement the key rule, nobody can talk to each other. It was later in the evening and much fun was had staring each other down and banging the “Do Something Pawn” on the table. The “Do Something Pawn” is probably my new favorite name for a game component. Ready to conquer the Wasteland in my classic car and trusty trailer. Machine guns sold separately. 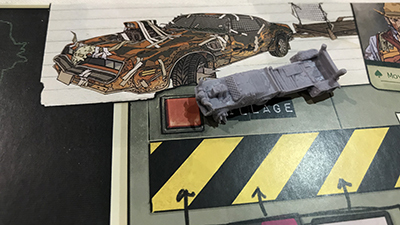 Wasteland Express Delivery Service: We pulled this out to learn the night prior and quickly realized that just wasn’t realistic. We tackled it first thing on day #2 when the group reconvened. High on my list of games to make sure I tried, Wasteland did not disappoint. We had a slow game and wound up stopping short of the finish due to player fatigue and some incredibly long turns. I would love to try this again at a lower player count (we had the max of 5), as it seemed like rounds should move fairly quickly. The pick up and deliver aspects were well done, but nothing beat souping up my rusty Trans Am lookalike with machine guns and turbos to take on the dangers of the wasteland. Indian Summer: My wife and I love playing the Patchwork app and I have been eyeing Cottage Garden as a possible purchase. A few weeks before SaltCON I heard about Indian Summer and knew I had to try it. We snagged this from the game library after the overly long game of Wasteland Express Delivery Service. It proved the perfect game for relaxing in the early afternoon. I enjoyed covering my forest floor with leaves and animals, and the goal being to cover the board first was a nice twist from the points driven victories in Patchwork. I feel like there was a layer of deeper strategy to be uncovered on multiple playthroughs as well. I’d like to purchase this one at some point down the road. The art and theme definitely appealed to me more than Cottage Garden. 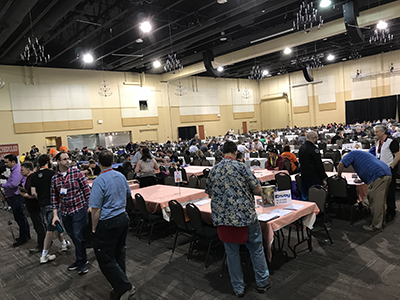 Captain Sonar: I have been itching to try this since it was announced and what better place to play a boisterous 8 player game than a convention? We had a blast playing the real time version with 8 players. My team’s submarine was eventually destroyed but the intensity was great and the thrill of the hunt and chase was spot on. I would buy this if I thought I could get it to the table. I will definitely look to play it again at future organized events. Hardback: We love Paperback. After playing the app we picked up the physical game about a month before Hardback was first announced. I have wanted to try Hardback and see if I could justify having two word game deck builders in my collection. Unfortunately playing it only muddied that decision. The game is excellent and feels completely different from Paperback. I loved the points system and the genre combos. I found where Paperback pushes you to use all of your letters for maximum purchasing power, Hardback encourages you to focus on a few key letters which will combo to create the highest score. I still am not sure if I can justify owning both, but I know I really want to buy Hardback AND I love Paperback. 7 Wonders Duel: By Saturday we were pretty wiped out mentally. We enjoyed the exhibitor hall and made some awesome buys at the game swap. By the time we managed to sit down for a game we decided we’d learn 7 Wonders Duel. Having never played 7 Wonders we had nothing to compare it to. We enjoyed it, I’d like to play it again sometime. The dinosaur park is looking pretty full. Better watch that security level. Dinosaur Island: Technically I had played this once before. But I couldn’t leave SaltCon without getting my wife to play it. Not to be found among the Hot Games or the Game Library, we were able to play a friends copy. This simple worker placement game absolutely sings when all the pieces are combined together. Plus guests are eaten by rampaging dinosaurs. We will definitely be picking this one up soon. This list doesn’t include all the chances we had to teach games to others. I really enjoyed sharing my favorites with those we met at the convention hall. 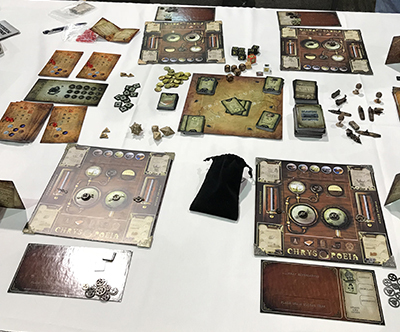 Rick Lorenzon’s prototype for Chrysopoeia, a beautiful looking game of staving off the apocalypse with worker placement and resource management. 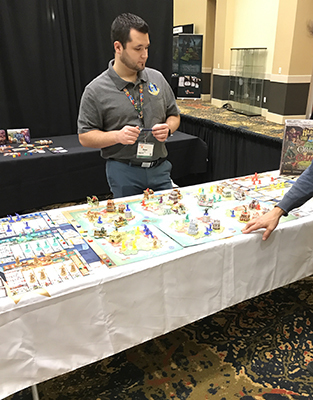 In addition to these great games, I enjoyed talking with a few designers and publishers both in the exhibitor hall and those who entered games in SaltCon’s Ion Award competition. I finally had the chance to meet designer Rick Lorenzon and check out the prototype of his upcoming game. I wasn’t able to demo the game, so I am speaking solely about production quality, but it looks quite impressive. I have interacted with Rick a bit online and know he is putting a lot of playtesting into Chrysopoeia. SaltCON was great and I am already looking forward to next year. We will definitely keep an eye out for similar events going forward. What is your favorite local gaming event?